The Jordan Valley is a low-lying strip which cleaves down the western border of the country. It is part of the Great Rift Valley, which extends down southwards into East Africa. The Jordan Valley is divided into several distinct geographic sub-regions. Its northern part is known as the Ghor, and it includes the Jordan River. Several degrees warmer than the rest of the country, its year-round agricultural climate, fertile soils and water supply have made the Ghor the food bowl of Jordan. The Jordan River rises from several sources, mainly the Anti-Lebanon Mountains in Syria, and flows down into Lake Tiberias (the Sea of Galilee), 212 meters below sea level. It then drains into the Dead Sea which, at 400 meters below sea level, is the lowest point on earth. South of the Dead Sea, the Jordan Valley turns into the hot, dry Wadi Araba, the "wilderness" or "Arabah desert" of the Bible. People first started to abandon the nomadic lifestyle and plant crops in the Ghor about 10,000 years ago. Villages were built, water-harnessing schemes were implemented, and by about 3000 BCE, produce from the valley was being exported to neighboring regions. The areas fertile lands were chronicled in the Old Testament, and the Jordan River is revered by Christians as the place where John the Baptist baptized Christ. After 1967, when Israel conquered the "West Bank" of the Jordan River, the population of the Ghor fell from 60,000 down to about 5,000 by 1971. During the 1970s, however, new roads and villages were built, and the population has now soared to over 100,000. There are no major cities along the Jordan River. In the last few decades, modern methods of farming have vastly expanded the agricultural output of the area. The latter years of the 1950s witnessed the construction of the East Ghor Canal (now known as the King Abdullah Canal), which runs down the east bank of the Jordan Valley for 69 kilometers and has brought substantial areas under irrigation. The recent introduction of portable greenhouses has brought about a seven-fold increase in productivity, allowing Jordan to export large amounts of fruit and vegetables year-round. 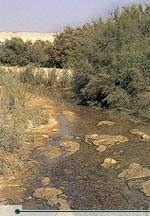 The Jordan Riveror River Jordan, as it is commonly calledis one of the most sacred places, both historically and symbolically, for Christians throughout the world. Joshua, Elijah, Elisha, John the Baptist and Jesus Christ all crossed it during their lifetimes, and it is associated with some of the most important events in the Bible. After the death of Moses, the Bible says that God stopped the waters from flowing, allowing Joshua to lead his people across the River Jordan into Canaan (Joshua 3: 14-17). This reportedly took place at a ford in the river directly opposite Jericho known as Bethabara, or Beit Abara ("house of the crossing"). This place, opposite Jericho, is believed to be the same place where the Prophets Elijah and Elisha parted the waters and crossed miraculously to the east bank of the Jordan. From a nearby spot on the east side, Elijah then ascended into heaven "on a chariot of fire and horses of fire" (2 Kings 2: 5-14). For Christians, the most significant event associated with the River Jordan is undoubtedly the baptism of Jesus Christ by John the Baptist. Interestingly enough, this also took place very close to Beit Abara, where Joshua, Elijah and Elisha crossed the river. In New Testament times, it became known as Bethany, the village of John the Baptist. This Bethany is not to be confused with the village of Bethany near Jerusalem, where the Bible says Lazarus was raised from the dead. Al-Maghtas. © Michele Piccirillo The Bible clearly records that Jesus was baptized by John the Baptist (Matthew 3: 13-17), and that John the Baptist lived, preached and baptized in the village of Bethany, on "the other side of the Jordan" (John 1: 28). 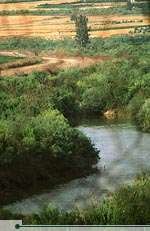 The baptism site, known in Arabic as al-Maghtas, is located at the head of a lush valley just east of the Jordan River. It is now protected and by early 1999 it will be accessible to visitors. After Jesus baptism at Bethany, he spent forty days in the wilderness east of the River Jordan, where he fasted and resisted the temptations of Satan (Mark 1: 13, Matthew 4: 1-11). The Dead Sea is 75 kilometers long and from 6 to 16 kilometers wide. It is fed by the Jordan River, but it has no outlet. As its name suggests, the Dead Sea is entirely devoid of plant and animal life. This is due to an extremely high content of salt and other minerals350 grams of salt per kilogram of water, as compared to about 40 grams in the worlds oceans. This concentration is caused by a rapid rate of evaporation. These natural elements give the waters of the Dead Sea certain curative properties, recognized since the days of Herod the Great over 2000 years ago. Also famous for their restorative powers are the thermal mineral springs of nearby Zarqa Maeen, which hosts a therapeutic health spa. The Dead Sea is also famous geographically as "the lowest point on earth," lying some 400 meters below sea level. In addition to the historical significance of the "Salt Sea," as it was referred to in the Bible, the Dead Sea is today an important and rich source of minerals essential for agricultural and industrial development, as well as for the treatment of various medical conditions such as psoriasis. Visitors to the Dead Sea come away with an unforgettable swimming experience, as the high density of the water makes sinking virtually impossible. Indeed, swimming is also difficult, as one is lifted too high in the water to be able to stroke properly. More appropriate is the often-photographed pose showing a visitor reclining in the water, leisurely reading a perfectly dry newspaper. At the southern end of the sea, the Arab Potash Company has built vast evaporation ponds covering over 10,000 hectares to extract potash from the mineral-rich waters. The project has allowed Jordan to become one of the worlds leading potash exporters. Of particular importance is the wide plain along Jordans southeast Dead Sea coast known today as the Southern Ghor. Known in the Bible as the Valley of Saltundoubtedly because of the natural salt formations which form along the waters edgeit is where David "slew 18,000 Edomites" (2 Samuel 7:29). This wide plain is also where Abraham and Lot divided their herds and people, going their separate ways after the journey from Egypt. While Abraham journeyed into Canaan, "Lot chose for himself the whole plain of the Jordan and set out toward the east" (Genesis 13: 11). 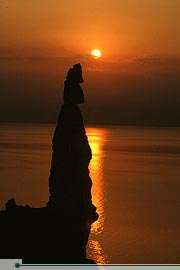 Lot's wife stone, the Dead Sea. The Bible then says that "Lot lived among the cities of the plain and pitched his tents near Sodom" (Genesis 13: 12). The Southern Ghor may thus be associated with one of the most dramatic stories in the Bible, that of Sodom and Gomorrah. While conclusive proof has not yet been found, some scholars see Bab al-Dhra and Numeira as good candidates for the biblical Sodom and Gomorrah, destroyed by God because of their wickedness (Genesis 19). The other biblical "cities of the plain"Admah, Zeboiim and Bela (or Zoar)may still be waiting to be rediscovered under the ruins of Early Bronze Age towns as Feifa, Safi, Khneizirah, and other places throughout the biblical Valley of Salt. One of Jordans most exciting archeological discoveries of recent times is at Deir Ain Abata, the cave where Lot and his family sought refuge from the devastation of Sodom and Gomorrah. A pillar of salt near Deir Ain Abata is said to be Lots wife, after she turned to watch the destruction of Sodom. A monastery built by early Christians in commemoration of Lots sanctuary was recently unearthed at the site. The monastery obviously welcomed pilgrims to the cave of Lots refuge, which can be visited as well. A host of Bronze Age, Nabatean, Byzantine and early Islamic artifacts have also been found at Deir Ain Abata. Not surprisingly, the Byzantine period saw the laying of elaborate mosaic floors, some of which can still be seen today. It is likely that the monastery was abandoned during the eighth century CE, probably because seismic pressure forced the collapse of the basilica and other structures. The monastery and cave are situated precariously on the side of a slope, and at least a third of the monastery has tumbled down the hill. Deir Ain Abata is situated about two kilometers north of the phosphate-mining town of Safi, on the hill overlooking the Dead Sea. Deir Alla is located in the Northern Ghor along the main Jordan Valley road, a short distance southwest from Ajloun and 50 km. north of the Dead Sea. An impressive temple was built on the hill of Deir Alla around 1500 BCE, and it is likely this ancient cultic and market center was the biblical Succoth, visited by Gideon as he chased the Midianites back to the east (Judges 8: 5-16). The sanctuary was in use until about 1200 BCE, when it was destroyedprobably either by an earthquake or by the legions of Pharoah. Three miles to the east lies biblical Mahanaim (known in Arabic as Tulul al-Dhahab al-Gharbi, or "the western hills of gold"), where Jacob camped on his way to meet his brother Esau (Genesis 32: 1). Just east of Mahanaim is Tulul al-Dhahab al-Sharqi ("the eastern hills of gold"), which may be the ancient Penuel ("the face of God"), where Jacob wrestled all night with God in the form of a man before reuniting with his brother Esau (Genesis 32: 22-32). The ancient city of Pella, known in Arabic as Tabaqat Fahl, is believed to have been inhabited as early as 5000 BCE. It was during the Greco-Roman period, however, that Pella truly prospered. Strategically placed at the crossroads of numerous trading routes linking Europe, the Near East and Asia, the city flourished from trade and was influenced by a multitude of diverse cultures. Like many of the ancient cities of Jordan, Pella came successively under the rule of the Ptolemies and the Seleucids. Disaster struck in 83 BCE, however, when the Hasmonean leader of Judea, Alexander Jannaeus, largely destroyed the city when its inhabitants refused to embrace Judaism. Pella was one of several Hellenistic communities on the east bank of the Jordan River that was targeted by Jannaeus. Pella and a host of other Hellenistic cities were freed from the Hasmoneans in 64 BCE when Pompey of Rome extended his rule southwards. 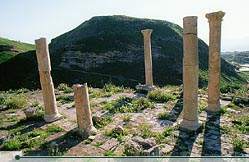 Pella was incorporated into the Decapolis, the confederation of ten cities linked by commercial and political interests which Pompey formed after his conquest of Syria, Palestine and Transjordan. Because of its proximity, Christians fled from Jerusalem to Pella to escape the First Jewish Revolt in CE 66-70 and Roman persecution during the first and second centuries after Christ. The Byzantine era saw a revitalization of Pella, as trade routes strengthened and local industries developed. Approximately 25,000 people lived in or near Pella during the late fifth century CE. The Byzantine armies were defeated by the Arab armies at the Battle of Yarmouk in 636 CE, and Islam soon became the dominant religious and cultural influence throughout the land. Pella which received the Arabic name of Fahlcontinued to prosper under Islamic Umayyad rule, until the great earthquake of 747 CE brought much of the city crashing down. Even then, archeological evidence indicates that the city remained inhabited on a modest scale. The Mamluks occupied it in the 13th and 14th centuries, but then the city was virtually abandoned for five centuries. Today, Pella is gradually being unearthed by teams of American and Australian archaeologists. As you climb up the steep wadi, you will notice to your left three columns which mark the spot of the sixth-century West Church. Continuing along, there are the remains of a 14th century Mamluk mosque and a graveyard. Off to the left is an immense water tank, built by the Byzantines to hold 300,000 liters of water. You then approach the main ruins, which consist of houses, shops, store houses and other staple constructions of city life. Below on the right lies an assortment of Byzantine and Roman public buildings. Sitting on the stream bed, or Wadi Jirm, is a first century CE Roman odeon, or theater. Next to this are the ruins of a large Byzantine church, built in the sixth and seventh centuries on top of a Roman shrine. The remains of Roman baths are also visible in this area. Perched up on the east, on a natural balcony overlooking the valley, is the East Church, erected during the late fifth century CE. To the south is Tel Husn, on top of which was a Byzantine fortress. Pella is located 30 kilometers north of Deir Alla on the Jordan Valley Road. From Amman, it is a 95 kilometer drive. To reach the site from the main road at the city of al-Masharia, hike two kilometers up the path to the east of the road.